When I set up a table view with 4 rows, there are still extra separators lines (or extra blank cells) below the filled rows. How would I remove these cells? Just drag a UIView to the table. In storyboard, it will sit at the top below your custom cells. You may prefer to name it "footer". Here it is shown in green for clarity, you'd probably want clear color. Note that by adjusting the height, you can affect how the "bottom bounce" of the table is handled, as you prefer. (Height zero is usually fine). Here's another way to do that w/out the grouped table style, and one you'd probably not guess. Adding a header and footer to the table (perhaps one or the other suffices, haven't checked) causes the separators to disappear from the filler/blank rows. I stumbled onto this because I wanted a little space at the top and bottom of tables to decrease the risk of hitting buttons instead of a table cell with meaty fingers. Here's a method to stick a blank view in as header and footer. 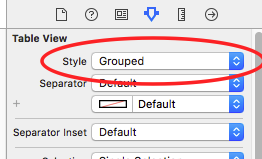 Use whatever height you like, you still eliminate the extra separator lines. In response to @Casebash, I went back to the code in my app ("AcmeLists" List Manager in iTunes store...) and short-circuited the addHeaderAndFooter method to verify. Without it, I have the extra row separators; with the code, I have what you see in this window snap: no table row separators picture. So I'm not sure why it wouldn't have worked for you. Moreover, it makes sense to me that having any custom footer on a table view would necessarily have to stop drawing row separators for blank rows below it. That would be hideous. For reference, I looked at tables where there were more rows than could be viewed on screen, and then for a table with two rows. In both cases, no extraneous separators. Perhaps your custom views were not actually added. To check that, set the background color to something other than clearColor, e.g., [UIColor redColor]. If you don't see some red bars at the bottom of the table, your footer wasn't set. //change height value if extra space is needed at the bottom. Simply drag a UIView into your UITableView as the footer. Set the footer view's height to 0. There is a better approach: add a 1 point line at the end of the table view as the footer and the empty cells will also not been shown anymore. inside the first possible method (usually in AppDelegate, in: application:didFinishLaunchingWithOptions: method). I know this Question has be accepted answer but i put here different ways for how to hide Extra separator line of UITableView. You can hide tableView's standard separator line, and add your custom line at the top of each cell. just add this code (Swift) . . 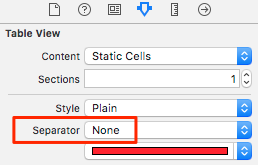 If you don't want any separator after the last cell, then you need a close to zero but non-zero height for your footer. Just add an view with the desired separator color as background color, 100% width, 1px height at the position x0 y-1 to your tableViewCell. Make sure the tableViewCell doesn't clip subviews, instead the tableView should. So you get a absolut simple and working separator only between existing cells without any hack per code or IB. Note: On a vertical top bounce the 1st separator shows up, but that shouldn't be a problem cause it's the default iOS behavior. I was using a table view to show a fixed number of fixed height rows, so I simply resized it and made it non-scrollable. You may find lots of answers to this question. 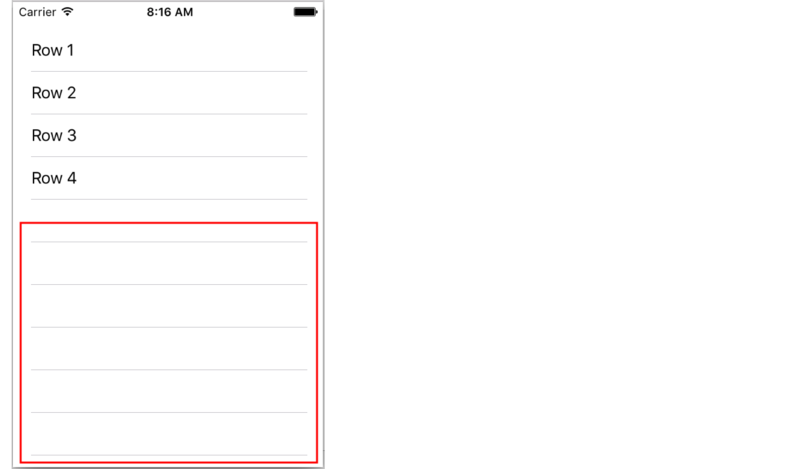 Most of them around manipulation with UITableView's tableFooterView attribute and this is proper way to hide empty rows. For the conveniency I've created simple extension which allows to turn on/off empty rows from Interface Builder. You can check it out from this gist file. I hope it could save a little of your time. 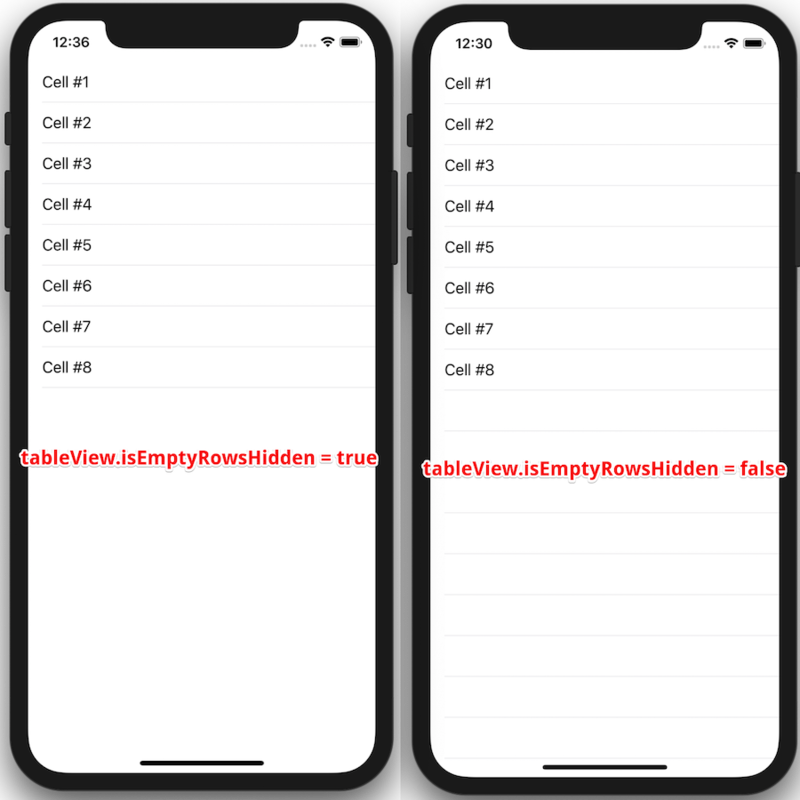 To eliminate extra separator lines from bottom of UItableview programmatically, just write down following two lines of code and it will remove extra separator from it. This trick working for me all the time, try yourself. However, there was no effect on my tableView - I believe it may have something to do with the fact that I was using UITableViewController. This worked fine for a tableView with a single section (if you have multiple sections, you need to specify the last one). Quick and easy Swift 4 way. 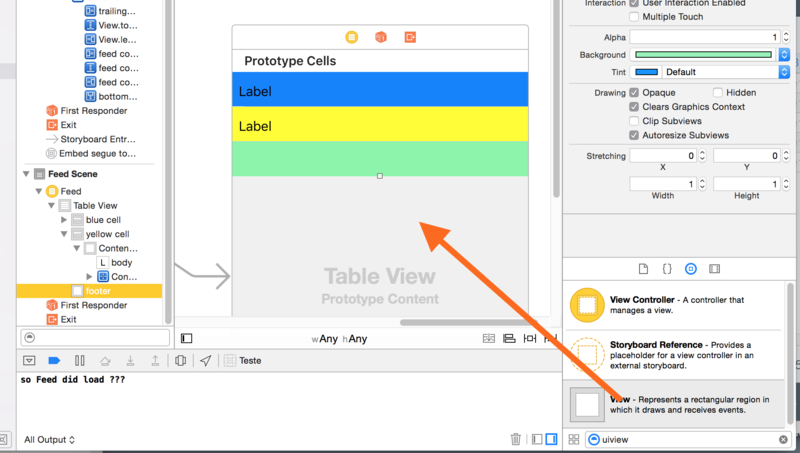 UIKit does not create empty cell when the tableView has a tableFooterView. So we can make a trick and assign a zero height UIView object as footer of the tableView. In Swift (I'm using 4.0), you can accomplish this by creating a custom UITableViewCell class, and overriding the setSelected method. Then the separator insets all to 0. (my main class with the table view has a clear background) color. Not the answer you're looking for? Browse other questions tagged ios uitableview cocoa-touch or ask your own question. How to remove empty cells in UITableView? Can I force a UITableView to hide the separator between empty cells? How to remove empty cells from UITableView? How to remove the last border of the last cell in UITableView? Is there a way to remove the separator line from a UITableView?